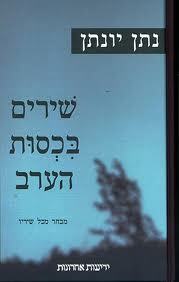 Yedi'ot Aharonot Publishing, Hemed Books, 2004, 429 pp. how it chases away clouds in its flights and scatters…"
My heart went out to the words, to the reader's voice, to the bewitching rhythm of the verse. I forgot all else, the stinking ops room, the tranquil silence outside, the cruel war dozing through Shabbat. Only the poet's soft intonation filled the air. The melancholy enchantment of the poetry briefly transported me from the SLA command post in Marj-ayun and the endless war in Lebanon. When I later looked back on those precious moments during the war, I asked myself more than once: What, in truth, was the secret of Yonatan's beguiling poetry? I cannot in this space lay bare all the elements that made Yonatan's poems so magnetic, but I'll focus on several of them. Alexandria. Did he consider himself a member of this splendid Mediterranean fellowship, of the company of poets such as Konstantin Kawafis, to give just one example? And after the sea comes the shore. The seacoasts also constitute a fixed presence in his poems. The perpetual tension between the sea and shore is a central theme in his work. Yonatan strives to make use of it. He expands and enriches it, he hurls it at our maritime neighbors, at their love and their ever-receding youth forever seeking its end, its death, on the shore. departure to the world but, above all, as a final station for journeys to distant lands and the poet's life course. of sorrow joined to the mutability of beauty and of the icons of beauty. The enduring tension between incessant grief and the eternally ephemeral subjects and objects of beauty is one of the central themes of his poetry. I am unable here to elaborate further. Before us is a selection of original poetry, surprisingly different from what we are accustomed to see in it. The time has come for Yonatan's poetry to break free of the exclusive control of popularity, as it were, to become the inheritance of serious literary criticism, of a sophisticated reading public and of academic literary research. His poems have a timeless appeal and unexpected depths that now stand out, illuminated and clarified through their length and breadth, in this excellent collection. להזמנת הרצאה על נתן יונתן ושירתו מאת מקים האתר לחצו כאן. אתר זה אינו האתר הרשמי של נתן יונתן.